Erik’s Fat Boy Motivation: where is your focus? Where is your attention? Are you laser pointed on weight loss without bettering health? Sometimes we get so motivated by acute desires that we negatively impact ourselves as a whole. When we set our goals and desire to a more holistic, total body approach the results are usually more satisfying. You could equate this to how you clean your home. If you focus on just dusting, but never vacuum are you really doing any good? Or is you are simply rinsing off dishes instead of actually washing them eventually someone is going to get sick. The same goes for our bodies. If we focus on simply losing weight then we can overlook (and often do) how we plan to accomplish this. We cheat, we take shortcuts like pills or starving ourselves to reach this seemingly benign goal. My challenge to you is include something to add with the weight loss. It could be lose fat and increase muscle tone. The number on the scale may not change as much as you would like, but the drastic change in clothes is rewarding. Goal evaluation is important. Unhealthy goals or unrealistic goals are just as damaging as doing nothing to improve your health. Taking just a little bit of time to determine what you really want and finding the best way to do this is ideal. 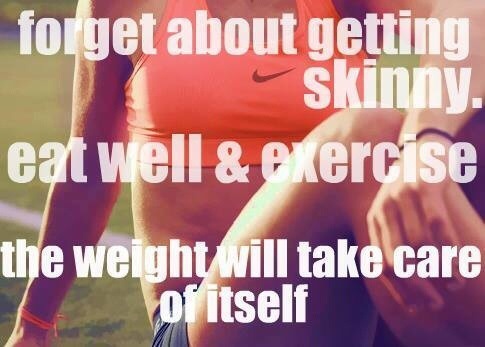 You didn’t put the weight on overnight so don’t expect it to come off overnight. It will take time, determination, and work so might as well do it right the first time so you don’t have to do it again. I am so tired of going down this weight loss path which is why I made lifestyle changes, not just food OR working out, but BOTH! So here’s to you taking the time to think about how you are accomplishing your goals!